Arphaxad.........Babylon's fortress, but I will make babylon fade away ! Shebuel............captives delivered by Elohiym ! Rehoboam........and Who sets the people free. Jehoram...........and whom YHWH raised up ! Joash...............and YHWH is Strong ! Uzziah..............My Strength is in YHWH ! Manasseh..........It made (me) forget (my misery). Zerubbabel........the exiles who are in babylon. Abiud................My Father is Glorious ! Akim................will YHWH raise up ! Eliud.................My Elohim is my praise ! 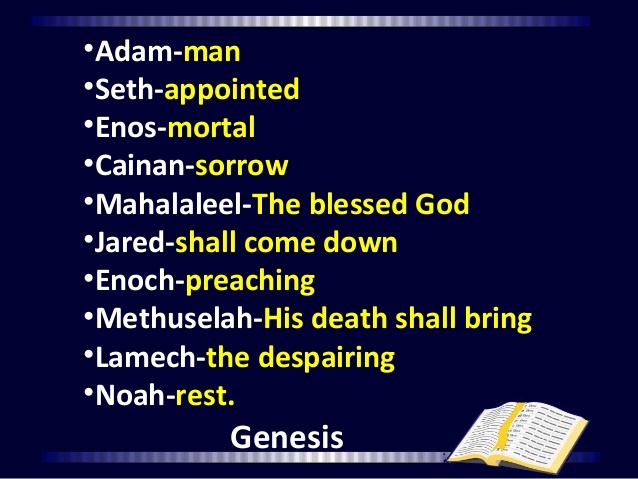 Ecclesia (Kehillah)..those called out of (babylon).